"Thanks Boomerang Bus Hire for your excellent service. Your efficiency and communication were very much appreciated and the reason we booked with you." Boomerang Bus Hire provides a reliable private airport transfer service. We offer an economical choice for your group (big or small) to get to/from airports on and around the Sunshine Coast. Whether you're travelling for business or pleasure, Boomerang Bus Hire understands the importance of a stress-free airport run. Travel with us and you can be sure of a seamless transfer between the airport and your destination. 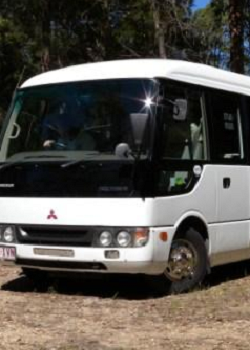 Contact Boomerang Bus Hire with your airport transport requirements on the Sunshine Coast. You'll be preparing for take-off with a smile on your face. Not only are our prices highly competitive, but we personalise our service to your exact requirements. This means there's no waiting around to fit in with other people on the bus. It's all about YOUR group and YOUR timings. In short, we offer a high-rate service at a low-rate price. Settle for nothing less than First Class when choosing your airport transfer on the Sunshine Coast, and contact Boomerang Bus Hire with your requirements. Simply call 1300 BUS MAN or email us your details. We look forward to being part of your journey.